When a fire occurs in your home it’s tempting to look up the closest maid service or schedule your cleaning lady for an extra visit. It seems logical after all, they know how to get things clean, right? There’s a difference between ordinary dust, dirt and grime and the greasy soot caused by a kitchen or house fire. The soot has to be removed before anything can even be cleaned. 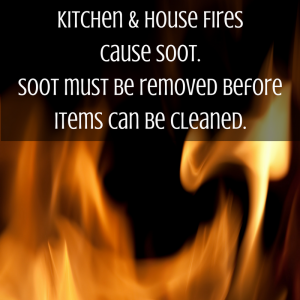 Since soot is oily it isn’t easy to remove and it will stain items like your carpet, curtains and furniture. That’s why it’s necessary to have professional restoration experts remove the soot before they start cleaning your furniture, carpeting and other affected textiles. Cleaning after a fire takes dedicated professionals who understand the nature of soot and smoke which the fire produces. They are able to remove soot and smoke odor and help restore your home to pre-fire conditions.